Does anyone have any weird or small headcanons about certain characters?? Like, not pelt colors or anything...but... maybe who they're related to, things they like to do, ect??? I seriously once shipped Bluestar and Whitestorm, and was dead-set on Runningwind being their son. Mind you, this was before Secrets of the Clans and Bluestar's Prophecy were released....and long before I found out that Fire and Ice, Forest of Secrets, and the rest of the original arc existed... Whooooops. I also think that Cloudstar of SkyClan is distantly related to Clear Sky, and Ravenpaw is a descendant of Lightning Tail.....and so many others. - I've always headcannoned Blackstar as this macho-tom with a secret heart of gold that he doesn't want anyone to know about (because he's the ShadowClan leader so he must appear tough at all costs). - I headcannon Spottedleaf and Cinderpelt being bffs up in StarClan, watching over Firestar, laughing at his mistakes, and gossiping with Sandstorm about him during her dreams. - Also that Hawkfrost became so evil and twisted because he felt like there was no where for him to belong, as well as the seeming rejection from his family; Tigerstar, Sasha, and eventually even Brambleclaw. But then once I found out about Blue/Oak, I thought that was so sweet and adorable that I had forgotten about Blue/White pretty quickly. I imagine Russetfur and Boulder as both single children (or only surviving in their respective litters) and thus grew up as practical siblings, especially since it's implied Russetfur was mostly raised by her mother (her father was a kittypet, and she specifically states that she never lived as a kittypet). I have exteeensive headcanons about how starclan's powers work that probably should go in their own thread. In my mind, Squirrelflight did NOT fake a pregnancy to help Leafpool. Instead, I like the idea that Squirrel WAS pregnant, and that the "twin telepathy" thing between her and Leafpool triggered her to go into labor early. I don't know; maybe I'm just attached to that version of events because I used it in a fanfic before the "big reveal", but it just makes so much more sense that Squirrel was pregnant and lost her litter than to think that they faked the whole thing without anyone suspecting. That is a good headcanon. I mean, Brambleclaw and Squirrelflight would have obviously had to have mated, otherwise none of that plotline would have made a lick of sense. So, would they have both been pregnant (Squirrelflight and Leafpool), or..? I actually like the idea of a miscarriage or something along those lines- it would have made that so much more understandable and would have definitely given Squirrelfight that extra nudge to protect Leafpool's kits even more. So, would they have both been pregnant (Squirrelflight and Leafpool), or..? Yeah, it would have been essentially a miscarriage/premature birth. I figure Squirrel got pregnant right around the time she got back together with Brambleclaw, which, IIRC, was a moon or so after Leafpool returned from her fling with Crowfeather. So if Squirrel's link with Leafpool caused her to go into labor at the same time as her sister, she would only have been about halfway through her pregnancy. I believe Blackstar and Mud paws are somehow related. 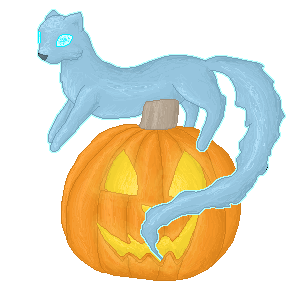 Last but not least, I believe Bluestar to be a relative of Blue Whisker. But that would be cruel since it essentially means Leafpool kill her sister's kit. I think Bramberclaw and Squirrleflight ( otherwise, it would be really awkwards) then they just pretend SquirrelFlight is pregnant and keep him away from her since I doubt Bramberclaw knows about she-cat ovulation cycle, lol. 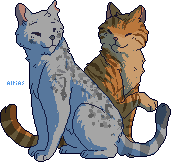 My favorite headcanon has to be Tallstar and Jake's "relationship" being the sole reason why Tallstar never took a mate in his birth Clan. My headcanon is that Ashfur displayed symptoms of severe borderline personality disorder that manifested after the stress of losing his mother. He kept them hidden for a while but the rejection he received from Squirrelflight drove him over the edge into full-on crisis mode. As someone with BPD I can relate to a lot of the things that Ashfur was feeling (you know, sans the murder plots and all), but it was very clear that he suffered from some kinds of mental illness. LOL, I am never going to think of Oakheart and Crookedstar the same way again. I have a similar head canon in the theme that DOTC characters being ancestors to modern warriors. I believe Gray Wing is a direct ancestor to Stormfur, something about their personalities and appearances feel eerily similar to me. I also have a headcanon that Lark will have kits and Pine will go on to be the next Stoneteller.One of or all of Lark's kits will feel dissatisfied with life in the Tribe and will go to join the clans, curious from the stories their grandfather told them. My favourite head canon though, is that Tallstar, confused about his sexuality after Jake, secretly fathered Longtail with Robinwing in a one night stand scenario similar to Bluestar and Oakheart. Later, Longtail and Mousefur wonder if they should be more than just friends. After a short fling and a mutual decision that they should just remain friends, Mousefur realizes she's expecting kits. Both she and Longtail feel they don't want the responsibility of being parents, so Mousefur sneaks off before giving birth and gives her newborn kits to a twoleg. When the grew up, they became wandering loners in search of adventure, and eventually settle down in a barn. One of them has kits of their own, and those kits go on to join SkyClan.